How does it work, this Critical Capabilities document? Critical Capabilities – we identified 10 critical capabilities that are both important to MES solutions, but are differentiators between one vendor product and another. Use Cases – MES systems are used in different ways across different industries. In order to adequately compare solutions, we defined use cases, based on manufacturing process and style rather than vertical industry. Each vendor product is rated against each critical capability on a 1-5 scale (poor to outstanding). The rating is based on a combination of customer reference information, vendor briefings and other research sources. 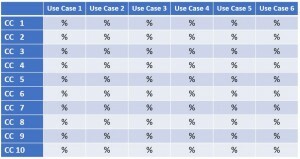 Then, for each use case, each critical capability is weighted based on its relative importance to the use case. A product score for a use case is simple math, the product score for each capability is multiplied by the use case weighting for that capability, and the sum of the weighted scores for each use case then becomes the product score for that use case. What if I don’t agree with the use case weightings? That is one of the coolest features of the interactive version of the Critical Capabilities document. You can customize the weightings to meet your needs. For example, if you are in a highly regulated industry, you may want to increase the weighting for critical capabilities that support regulatory compliance. OK, Mr. Analyst, what do the results of the Critical Capabilities for Manufacturing Execution Systems tell you? 1) The twenty-three products rated in the document were fairly close in ranking. MES is a relatively mature technology, so parity is not really a surprise. 2) Every vendor product excels at something, no vendor product excels at everything. 3) Applying use cases based on manufacturing process and style are more useful than industry groupings. For example, manufacturers that classify themselves as aerospace and defense make products from aircraft to satellites to armored vehicles to radar equipment to munitions, each with completely different manufacturing style, process and challenges. How do I get a copy of this Critical Capabilities for Manufacturing Execution Systems? Gartner clients can find the document here.